TOP Ships Inc. (the "Company"), an international owner and operator of modern, fuel efficient "ECO" tanker vessels currently focusing on the transportation of petroleum products, announced today that it has entered into a time charter agreement with Shell Tankers Singapore Private Limited for its 50,000 dwt product/chemical tanker M/T Eco Palm Desert until September 2020. The time charter with Shell consists of a fixed amount per day plus a 50% profit share for earned rates over the fixed amount and replaces a pre-existing charter. Evangelos Pistiolis, President and CEO of the Company, stated: "As of today, we have two vessels that offer exposure in the spot market during a period when the prevailing sentiment is bullish. If the positive market expectations materialize, our results will benefit as a result of this profit sharing arrangement." 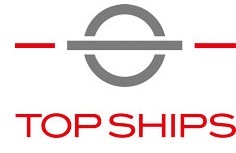 TOP Ships Inc. is an international ship-owning company. For more information about TOP Ships Inc., visit its website: www.topships.org.